It is certainly true that, where an Indigenous nation brings a title claim in court, the court will expect that nation to prove its claim. The procedural double standard in this approach has been pointed out by observers such as Professor John Borrows, who rhetorically asks: “Why should the Aboriginal group bear the burden of reconciliation by proving its occupation of land? After all, the Crown is the subsequent claimant. Why should the Crown not have to prove its land claims?” Nonetheless it is obvious that Canadian courts accept Crown title based, as Professor Borrows puts it, on “bare words,” while expecting Indigenous nations to prove their claim to pre-existing Aboriginal title. Legally there is no question that Aboriginal title exists, and there is no doubt that related rights of Indigenous nations to make decisions about and govern their territories also exist. The Canadian state lost its arguments that Aboriginal title does not exist, perhaps most notably in the Delgamuukw case brought jointly (with the Gitxsan) by hereditary leadership of the same Wet’suwet’en nation whose members were arrested under the Coastal GasLink injunction. In Delgamuukw, the Supreme Court of Canada did not delineate where Gitxsan and Wet’suwet’en title exists, holding that a new trial would be required for a Court to determine those factual matters. Yet the Court added: “I do not necessarily encourage the parties to proceed to litigation and to settle their dispute through the courts.” Instead, the Court encouraged “negotiations in good faith” to apply the principles it had articulated about the existence and application of Aboriginal title. However, for years afterward the Crown maintained a position that Aboriginal title does not apply on a territorial basis, but rather to small high-use areas within a territory. After another long title case, the Crown lost this argument in the Tsilhqot’in decision. Despite this recognition, in practice the legal reality of Aboriginal title and governance has been largely held back from on-the-ground application by the Crown’s fallback position, which could be cynically summarized as: “Yes Aboriginal title and governance exist, but we don’t know where exactly and it’s quite complicated, so in the meantime we’re going to continue making decisions as if it doesn’t exist anywhere.” This “prove-it” mentality is exhibited in the RCMP’s retracted statement about the Unist’ot’en camp. · Aboriginal title cases are long and expensive. The millions of dollars (and many years or decades) required to take an Aboriginal title case to trial, and likely through appeals, is prohibitive for many Indigenous nations. For example, the Delgamuukw case was filed in 1984, started trial in 1987, and received its final appeal decision in 1997 (which ordered a new trial). Unfortunately, so far the Crown has relied on the high practical barriers to Indigenous nations pursuing title cases and the slow pace at which they proceed to avoid truly accepting Indigenous title and governance as a constraint on Crown decision-making. The standard of consultation, which the Supreme Court of Canada initially articulated as a minimum interim measure pending resolution of Aboriginal title and rights issues, has often been treated as the indefinite norm. Without question, the circumstances surrounding the Coastal GasLink project are complicated. Other Indigenous nations have signed agreements with the company, as have band councils governing reserves within Wet’suwet’en territories. However, the Wet’suwet’en Hereditary Chiefs unanimously oppose the Coastal GasLink project, exercising their jurisdiction in Wet’suwet’en law (the Supreme Court of Canada in Delgamuukw described the system of Clans and Houses with Hereditary Chiefs as “the fundamental premise of both the Gitksan and the Wet’suwet’en peoples”). The fact that large projects may impact multiple Indigenous nations, and inevitably raise other complex considerations, is no excuse for a failure by the Crown to address the title and governance of a particular Indigenous nation. The Canadian state’s arrest and forcible removal of Wet’suwet’en people from their own territories for seeking to uphold the decision of their Hereditary Chiefs, without truly addressing the issue of Wet’suwet’en title and governance, is a stark and troubling example of the Crown’s “prove it” approach to Aboriginal title and governance. 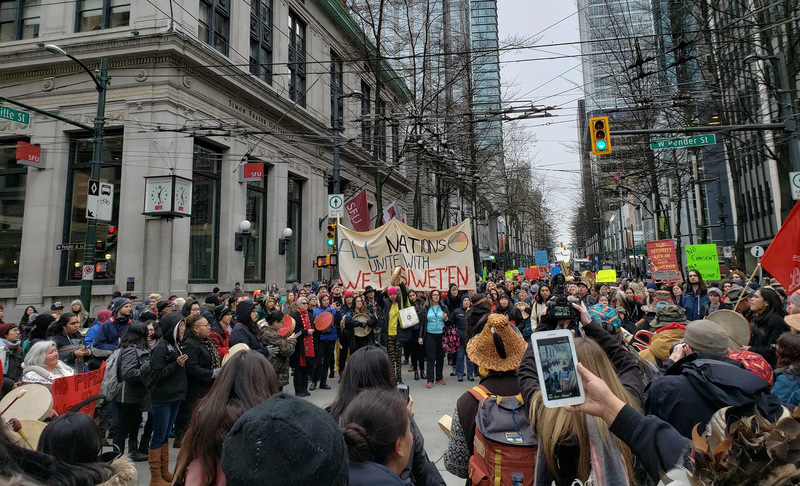 The need to respect the rule of law is often raised when it comes to pipelines; in fact, the Prime Minister himself raised it in response to the recent arrests in Wet’suwet’en territory. Respecting the rule of law is indeed important, but it can’t be selective. To truly uphold the rule of law, the constitutional recognition of Aboriginal title and governance must be meaningfully applied in Crown decision-making, before crucial decisions are made about Indigenous territories. The Crown’s resistance to concluding agreements that meaningfully recognize title and rights, while making important decisions unilaterally in the meantime, has enabled the Crown to benefit from its own long-term failure to respect the Constitution. This is untenable from the perspective of the rule of law, and it is clearly incompatible with commitments at the federal and provincial levels to rights recognition and reconciliation. More than two decades after the Delgamuukw decision affirmed Aboriginal title, the Crown’s continued pattern of making decisions in the absence of Indigenous consent – without resolving the underlying title and governance issues – undermines the constitutional foundations that are meant to define Canada. Ultimately, this is about much more than a pipeline. While a temporary and uneasy truce was reached to avoid further violence by the RCMP in Wet’suwet’en territories, Wet’suwet’en Hereditary Chief Na’Moks made it clear that, “It must be reiterated, we are adamantly opposed to this proposed project and that will never change, but we are here to ensure the safety of our people.” The Unist’ot’en camp has issued a statement that they “will use our voice to continue this battle by asserting our Rights and Title” and outlining options for people to peacefully show their support. So how can you support? Donate to Unist’ot’en Camp Legal Fund. Donate to Gidimt’en Access Point. Host (or attend) a solidarity event: See here for a list of upcoming events. Contact representatives: Send an email to relevant federal and provincial cabinet ministers. NOTE: For those wishing to visit the territory – As of Jan. 16, 2019, visiting the Unist’ot’en camp does not violate the injunction, which prohibits blocking access for Coastal GasLink workers. Visitors to the camp should inform themselves about the injunction and potential consequences, as well as local Wet’suwet’en protocols.